Why do you believe in sustainable tourism? Along my journeys far away from home as well in Switzerland, I get inspired and stocked from the places I am. Traveling recharges my batteries. However, I always feel like I should leave something positive behind in return. Isn’t that what sustainable tourism is meant to be? Being in a somewhat symbiotic relationship with the places we go to! What cause do you care about and a what actions do you take to lead positive change in the world? The intertwined relationship between humans and nature. Especially, our capability to change the climate fascinated or rather frightened me. I am lucky to be part of the Swiss Arctic Project. This project allows our team of five students to become a witness of a breath-taking environment of Svalbard that suffers from warming temperatures. In a short film and a Student Climate Report, we aim to capture different scientific aspects but also the consequences for ecosystems due to climate change. It is our main aim, to reach as many people as possible and move the folks out there to act and be inspired. What motivates you to become an MGT Ambassador? During my studies in environmental engineering and the preparation of the Swiss Arctic Project I discovered many challenges for the health of this planet. It can get very scary to know a lot but feeling unable to act. 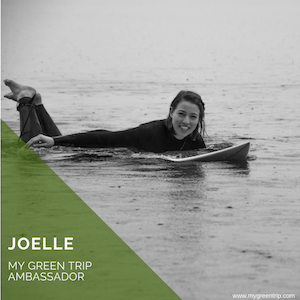 My Green Trip offers a very easy and understandable solution to be the change in this world. Tell us something special from your last travels. 7.07.2017, surfing the North Coast of Northern Ireland. I remember being in the water at 6am and no waves I would be able to catch – but two dolphins passing by! During the day, the conditions of the ocean chanced, and I was back in the water at sunset. The orange color of the sunrays was shining through the glassy lip of the breaking wave. The overhead wave has carried me into an unforgettable moment, and I really felt what it means to be in balance with nature!